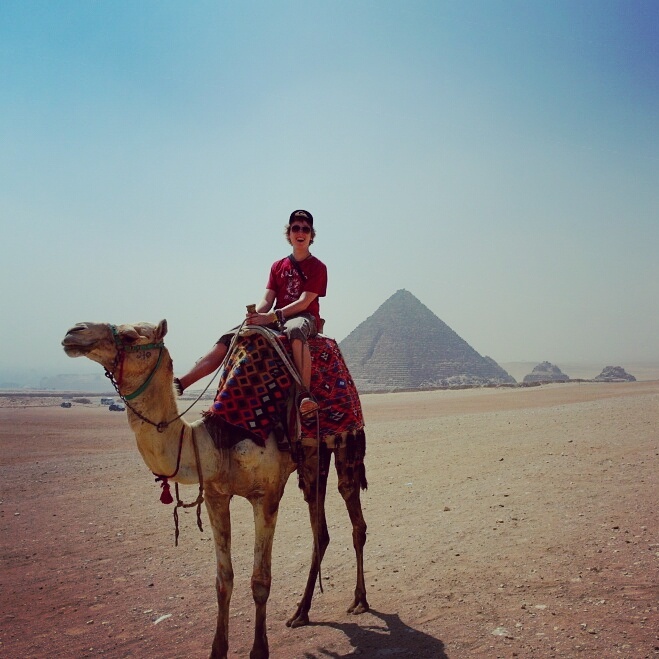 The day was finally here; I was going to visit the pyramids alone. While there is lots more to the country and city than these famous landmarks, it truly was the reason behind my two week adventure, and needless to say I was very excited. 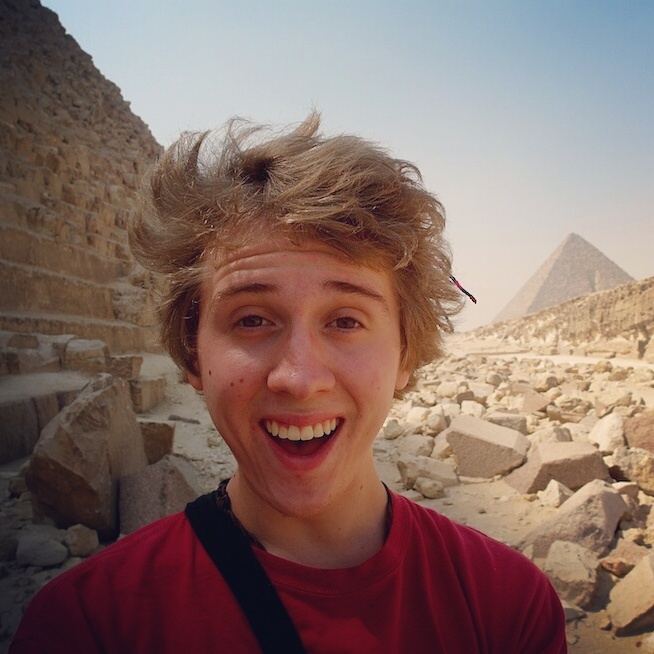 If you’re thinking of visiting the pyramids alone or as a backpacker, feel free to read through my story on how I did it, and comment if you have any questions. After slowing down the hostel’s WiFI with lots of research, and bothering the receptionist with loads of questions, I formulated my plan. The best time to visit the pyramids is early in the morning; it makes for the best light, the best weather, and the least amount of tourists. I woke up at 6:00AM, donned sunscreen, packed a daypack with a few water bottles, my camera, tripod, and anything else I figured I needed for the day. My plan was to take the metro to the other side of the city (El Giza) and then catch a bus from there. The Cairo metro at the time ran all night, so I had no problem catching a train that early in the morning. By this time I was a pro at the subway, and navigated it with ease. When I alighted, I walked around looking for a bus, but much to my surprise, couldn’t find a single one. 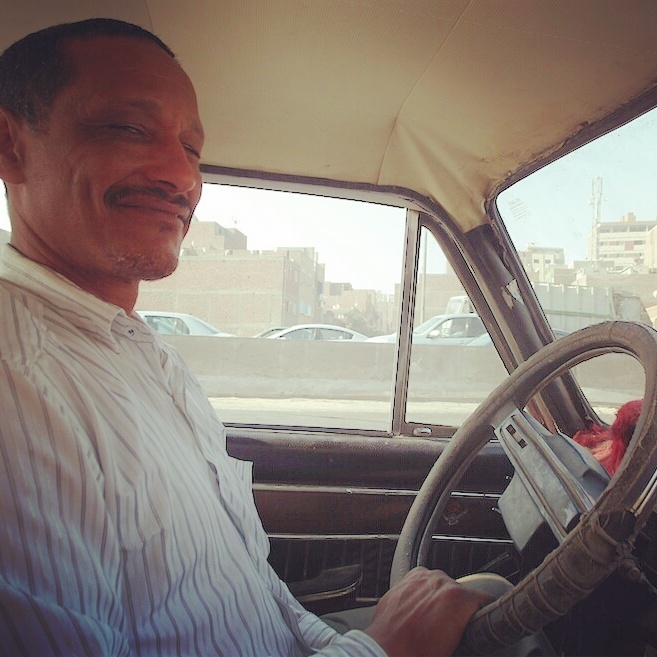 Eventually, I was approached by a gentleman with a taxi, who offered to take me the rest of the way for 20 pounds (make sure you always clarify Egyptian pounds (as opposed to British) when bartering… don’t make this common mistake). I hopped in his car and we were soon on our way. The drive was much longer than I anticipated, but still only about 10 minutes from the compound. On the horizon, between the buildings I could see the familiar shapes slowly creep upward as we drew closer. After a little bit, we pulled up at a shop near the compound and another man approached the taxi. The two men quickly discussed something in Arabic, and then started questioning me about my visit to the pyramids. 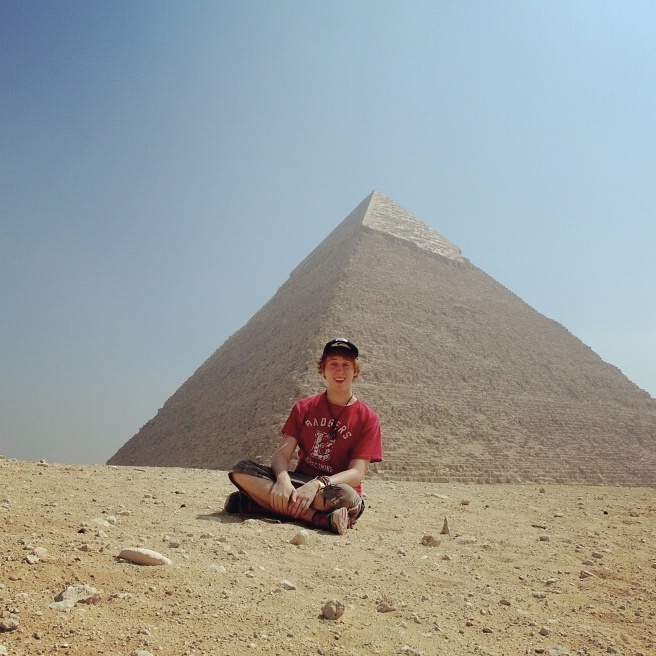 They informed me that the pyramids were in fact closed, and I needed to pay them money in order to visit them on a private tour. Nice try boys – I had done my research, and was well prepared for scams like this. I informed my taxi driver that I needed to be taken to the gate, as I had originally requested, and after much back and forth, he obliged. I was let off about 300 meters from the gate of the compound – likely out of spite, and I started walking towards the entrance. Fighting off vendors, I eventually reached the gate, and an angry traveller in front of me fighting with the ticket agent. I paid the student fee of 25 pounds, and flashed my ID card. I gave the agent a 50 pound note, to which he tossed me a ticket and turned his back in the booth. It wasn’t until I tapped on the glass that he begrudgingly tossed me my change, and I was on my way. Once inside, I passed through a security screen, and another man told me that I needed to follow him for additional screening. Not trusting him, I simply grabbed my things and pressed on. I wasn’t stopped by security, and the man passively went back to the next person. I had only been awake for 2 hours, and had 3 scams run on me so far… not too bad from what I had researched. The compound itself is impressive, but you’ll need to keep in mind that it is in the middle of the city. When viewing photographs of the pyramids, you envision them to be in the middle of the desert, far away from all civilization. 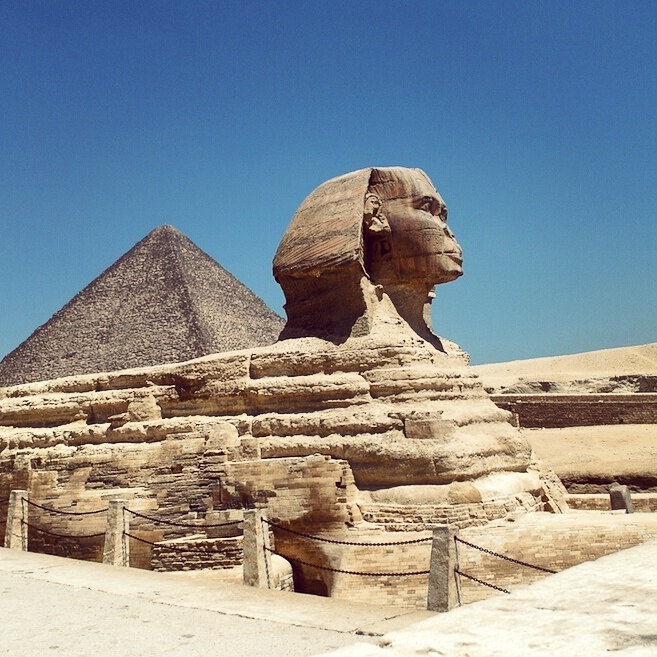 In reality, the Sphinx faces a pizza hut, and you can see the haze of the city all throughout the compound. However, this doesn’t take away from the impressiveness of it all. I spent the day exploring different areas of the compound, wondering on my own, thinking about the long passage of time, and admiring the feats of the human species. 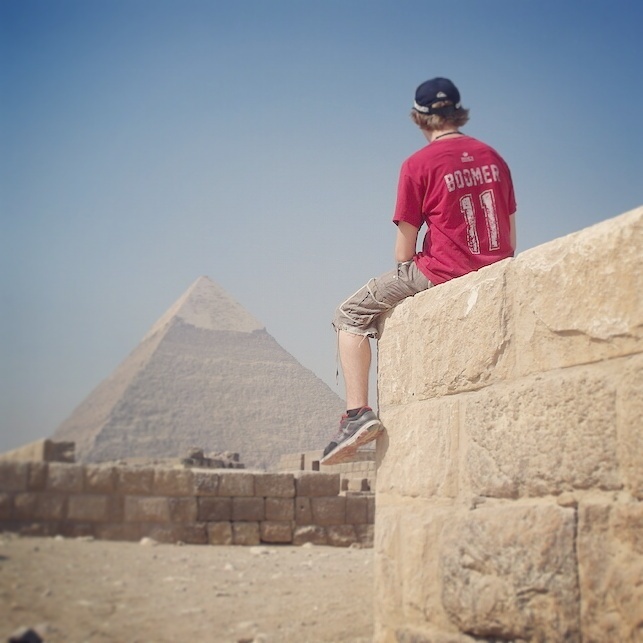 By the time noon rolled around, I grabbed some pizza, ate facing the sphinx, and was ready to head home. The journey back was far less eventful than the journey there, and I picked up some falafel outside of the metro. Not quite how I had imagined visiting them, but it makes for a good story, no?